Today, Thursday April 4 , over 400 fast food workers across NYC are starting a second wave of strikes for better wages and a union, marking the 45th anniversary of the assassination of Martin Luther King Jr.
Like the sanitation workers that Dr. King marched with in Memphis, these workers are standing up for dignity and respect for all workers. Will you support these courageous workers by mobilizing your friends, family and colleagues to come out today and Friday? Wendy’s in midtown Manhattan, 259 34th St.
Burger King in Harlem, 154 E. 116 St.
Wendy’s in downtown Brooklyn 425 Fulton St.
3) On Friday April 5, walk the striking workers back to work. Collective action is protected under U.S. labor law, and the workers are asking the community to be on-site at fast food locations around the city to support them as they return to the job. Sign up here; shifts are available throughout the day. On The Anniversary of The Triangle Shirtwist Factory Fire: Lessons Learned? The Great Hall at Cooper Union in lower Manhattan was packed, standing room only on this November 22nd, 1909 day. Garment workers from all over the city came to the same auditorium where Abraham Lincoln had denounced the proliferation of slavery nearly fifty years earlier. They were there to consider an industry-wide strike in support of the striking Triangle Shirtwaist Factory workers. Union leaders (men) droned on for nearly two hours, when suddenly a 23 year old, immigrant union organizer named Clara Lemlich burst up onto the stage uninvited, and said, “I would like to say a few words.” She then turned to her audience and said, “I have listened to all the speakers and I have no further patience for talk. I am a working girl, one of those striking against intolerable conditions. I am tired of listening to speakers who talk in generalities. What we are here for is to decide whether or not to strike. I offer a resolution that a general strike be declared now!” Her peers were wildly supportive. She then led a modified version of an old Jewish oath, “If I turn traitor to the cause, I now pledge may this hand wither from the arm I now raise.” And so began what was soon known as The Uprising of 20,000. The next day, all over the city garment workers walked off their jobs, and met in Union Square Park for a solidarity rally. The eleven week strike saw over 700 arrests. Strikers were being beat by company-hired thugs, and prostitutes, and police often turned their backs, and in some cases even participated in the beatings. Finally it ended with a Peace Protocol, with the hundreds of clothing manufacturers making different deals with their workers. Many companies became union shops where only union workers could be hired. The owners of Triangle Shirtwaist Factory resisted, giving in to only modest wage and hour concessions. The unsafe, over-crowded conditions remained the same at Triangle with doors only opening inward, shabbily constructed fire escapes, a barrel of oil stored on the floor, cloth tailings that were not removed on a regular basis, and incredibly exit doors that were locked during working hours. Then late in the afternoon on a beautiful spring Saturday (March 25th, 1911), while having tea with a friend near Washington Square Park a woman named Frances Perkins suddenly heard screams and sirens going off. She ran across the park and came upon the horrific site of seeing the first of 50-60, mostly women jumping out of the fire engulfed upper floors, of the ten-story Asch building. Triangle Shirtwaist occupied the 8th-10th floors. In the little more than a half hour that fire raged, 146 people died; 129 of them were women; Italian and Jewish immigrants mostly; the average age was 19, and the youngest, Kate Leone and “Sarah” Rosaria Maltese only 14. The bodies were brought to a covered pier on E 26th St so families could conduct the gruesome task of identifying their loved ones, if they could. New Yorkers were gripped with an immense feeling of grief and mea culpa. A meeting was called on April 2nd at the old Metropolitan Opera House to see what could be done so that these young women did not die in vain. The meeting became tense as people from different socioeconomic groups started squabbling - that until a young, immigrant, union organizer, named Rose Schneiderman started to speak. She held her audience spell-bound with her angry, chastising speech. Decades later Frances Perkins who was in attendance said, “..Wonderful, what a speech she made.” After the meeting, and that incredible oratory, a safety commission was formed. Ms. Perkins became the lead investigator, and their mission expanded into looking at all aspects of factory life in the over 2,000 factories that were inspected in New York state. Over thirty new laws were passed, and many of them were emulated by other states. At no time were the feelings of guilt and sorrow probably more evident than on a cold rainy April 5th day, when between 80-120,000 people gathered in and around Washington Square Park where a funeral procession was to begin for the victims of the fire. It was led by six horses pulling an empty hearse, followed by victims’ families, survivors of the fire, and garment workers from throughout the city. It is estimated that another 200-400,000 people lined the streets of the route towards, and up 5th Ave. This tragedy caused union enrollment to soar. People started to feel a sense of empowerment, and knew that there was strength in unity. Religious groups, community groups, unions, radicals, and reformers all banded together, putting aside their differences for the greater shared goal of improving people’s lives. And they did not ask for change, but rather they demanded it. The social advancements in this era, and in the decades that followed were made possible by people who had courage and were willing to make tremendous sacrifices so that they, and their progeny could live a life with dignity. And it is undeniable that most of us and our loved ones, past and present benefited greatly from the pain that those people endured to secure those gains. What we have forgotten is that - it is a never-ending battle to keep what we had inherited. The crisis that we find ourselves in today begs the questions; Do we have an economic system that can be adapted to a sustainable world in which not only the environment is taken into account, but where the peoples’ well-being is considered more important than profits? And the next more important question is; Do we as a people possess the mettle that our ancestors had to make the changes that we must make? Well.. It was said, “The New Deal began March 25th, 1911,” and the woman who said that was the first woman Cabinet member, Secretary of Labor, Frances Perkins - Yes that same Frances Perkins whose tea was interrupted on that fateful, shocking, life-changing day for her, all those years ago. 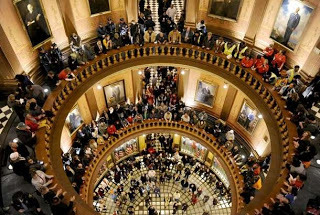 Last Thursday, nearly a thousand union members and supporters gathered inside the Michigan capitol building in Lansing to protest lawmakers' decision to ram through "right to work" legislation. The day ended abruptly when police began assaulting and pepper-spraying protesters, provoking an evacuation and lockdown of the capitol building. The protests have continued, and at least eight people have been arrested. This Tuesday, thousands more will descend upon Lansing to protest the 1%-backed "right to work" legislation, the most extreme anti-union law Michigan has ever seen. Nurses, teachers, autoworkers, service sector employees, iron-workers, and many other workers (including the unemployed), plus their families, allies, and communities, have already spoken out. Many have also received training and are preparing for nonviolent civil disobedience. Occupy stands staunchly in solidarity with these days of action. 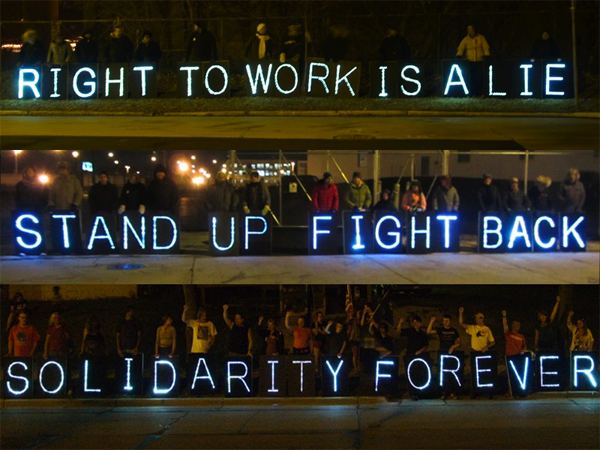 The unfolding events in Michigan are the latest assault on workers' rights in the U.S. and across the globe. Government policies such as the cynically-named "right to work" legislation will lower living standards for the 99% and benefit the elite who profit from our labor. In the face of these blatant attacks on low-income and working people, we must show sustained and escalating resistance. Together, we can defeat the Wall Street, corporate agenda of consolidating wealth in the hands of the few at the expense of the many. 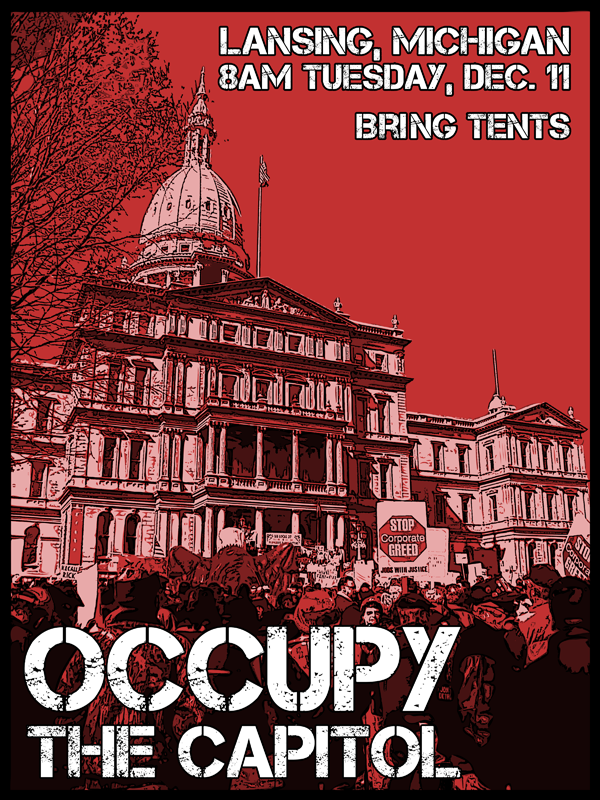 Therefore, we call on all Occupiers in Michigan, the Midwest, and beyond, to join in solidarity and Occupy the Capitol. Now is the time to activate the networks we've created and begin organizing for mass action. The lesson of Wisconsin's failed recall vote was that election politics are not enough — we need to put everything on the table: sustained physical occupation, mass civil disobedience, even the option of general strike. From the Flint Sit-Down Strike of 1936-37, to the West Coast Port Shutdowns of 2011-12, history has shown time and time again: direct action gets the goods. NYC, 12/11: Hold Walmart CEO Accountable! Just weeks after the massive demonstration of the #WalmartStrikers Black Friday day of action, Walmart CEO Mike Duke is visiting NYC on Tuesday, Dec. 11 to give a speech for the Council on Foreign Relations entitled "The Responsibility to Lead" - talking about women's economic empowerment, food security & the global middle class. That's ironic, since Walmart represents the epitome of corporate greed: from use of sweatshop labor, to the poverty wages it pays associates, to discrimination, to illegal retaliation against workers who organize. Mike Duke has no right to speak about the "global middle class", and IT'S TIME WE TAUGHT HIM THE MEANING OF RESPONSIBILITY. Join ALIGN, 99 Pickets, Walmart Free NYC, Occupy Bergen County, Retail Action Project, MoneyOut/VotersIn, and allies for an afternoon of action -- picket lines, street theater, and more. Text "@pickets" to 23559 for day-of text message alerts. The deaths of 120 workers from a fire at Bangladeshi sweatshop producing clothing for Walmart in incredibly unsafe conditions. Paying Walmart workers poverty wages, forcing many to file for public assistance, and for retaliating against workers when they began to organize and speak out about working conditions. 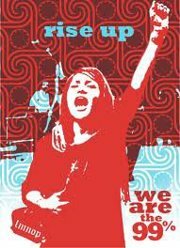 Times Square, Dec. 6: Rise Up New York! Smash Austerity! Support Workers! Mass Rally at Thursday 5PM Times Square! Last week, 200 workers at Wendy's, McDonald's, Burger King, Domino's and Taco Bell went on strike and joined workers at Car Washes, Supermarkets, and Airports throughout NYC in demanding better pay working conditions. On December 6th we’re standing up to protect the right to organize! Too many low wage workers rely on public assistance to get by in our economy. While workers throughout the city are making near or below minimum wage or are fighting to protect their wages and benefits, CEOs are making record incomes and their lobbyists are pushing our elected officials to cut spending on social programs and extend tax cuts for the richest 2%. We won't stand for this. We won't stand policies that prioritize tax cuts for millionaires over funding programs that working families rely on. And we are telling workers who are struggling at work that we've got their back. Stand with workers as they come together to demand better wages and working conditions and economic policy that’s good for all of us.